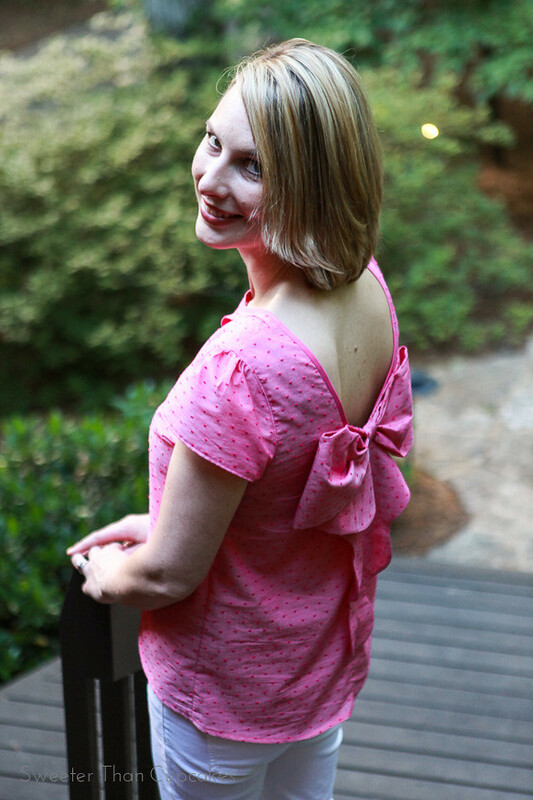 … and, all party and frill in the back. The gorgeous photography that captured it all is by my sister-in-law, Brooke. 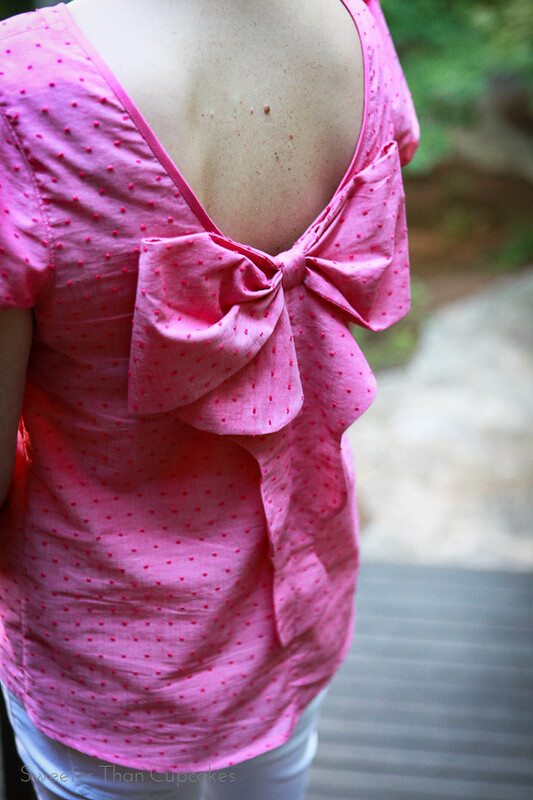 A little plunge and a giant bow make for a dramatic back. The greatest part is how simple this stunning bow comes together. 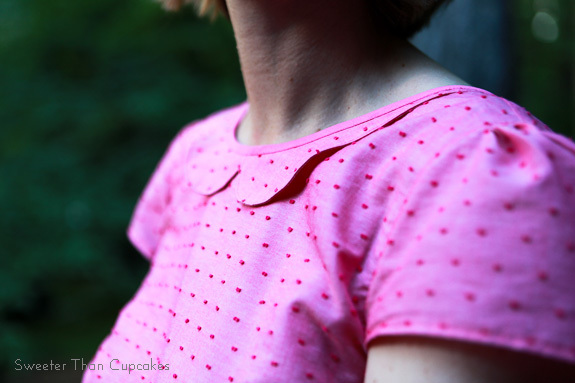 The narrowness of the peter pan collar gives it a more grown up feel. I spent some time on my muslin changing a few details to make the look exactly what I wanted, but there was no need to change the amazing basic design. Let me show you the few subtle changes that I made. First, I did a slight high/low hemline. I mean who doesn’t like a little extra cover in the back!?! I changed the sleeve to a cap sleeve. You can see the original and the cap on my muslin I posted on Instagram. I was worried that my undergarments might show or the top would be slipping off my shoulders all night, but neither were a problem. As for the fabric, it’s a very lightweight chambray swiss dot from Michael Levine. I love it! Thankfully, I have a tad more to make something for one of my girls. I think it would be fun to make a simple tank from this pattern with the dipped back and no bow too. You know I like options. 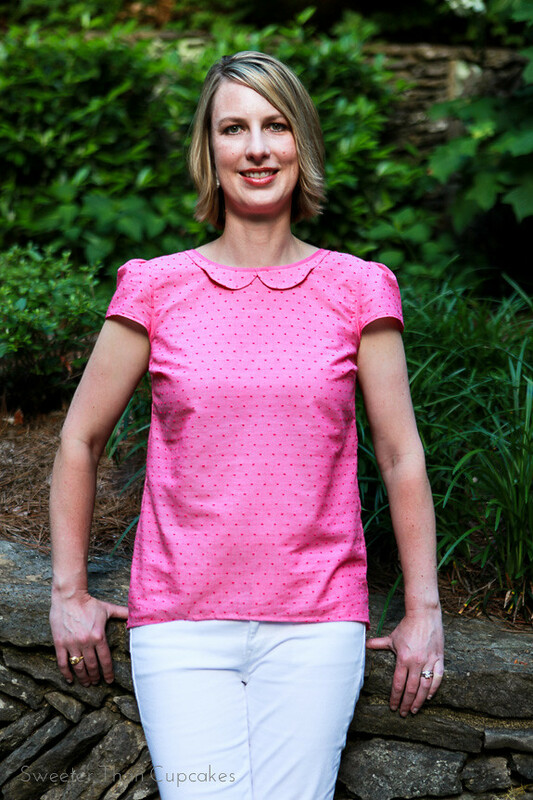 Now for you, Violette Field Threads has 3 copies of the Piper pattern to giveaway! 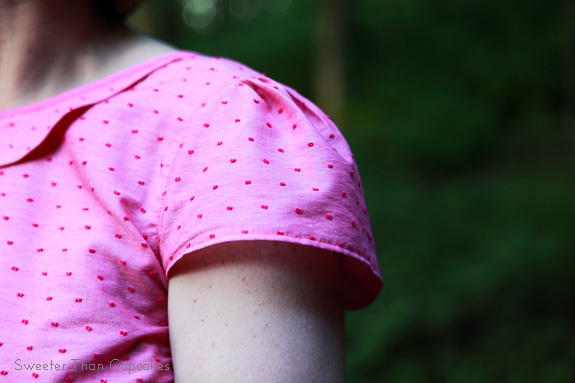 I have a awesome mauve fabric with tiny black stars that I am dying to use to make this top. I have a fun floral print in black, whit and gray that I would make it in. I have a navy/pink/yellow floral print I think would look good. 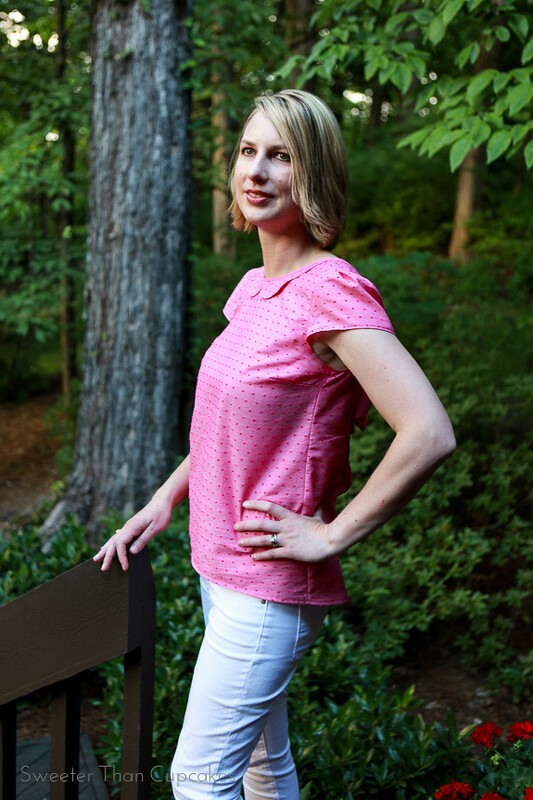 What a pretty pink top! You are looking good! I'm thinking of white eyelet! I really want to try this in a black sheer too! I love the chambray! I want to make this in a chiffon!! I have some great chevron chiffon that would be pretty! Pretty! I'd use a voile or chambray. I think the pattern will look super cute with eyelet fabric! Lace with a cotton underlay! Or maybe a cute seersucker. Pretty! I think some voile would be beautiful! Thanks for the giveaway! !